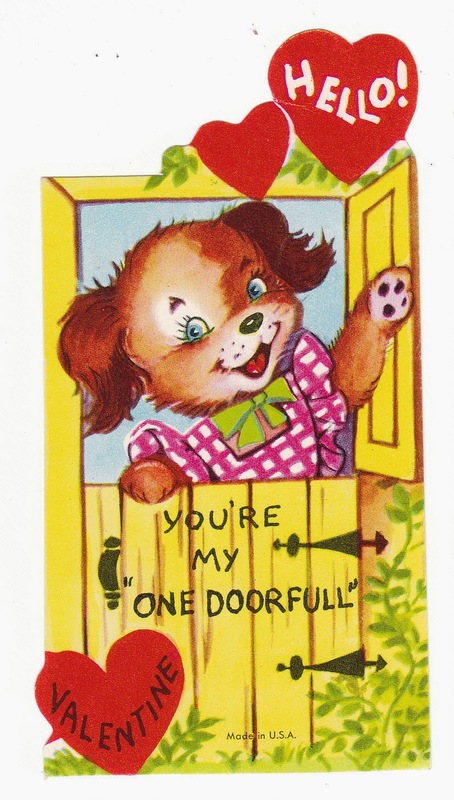 1940's Valentines for children - My favorite is the little Shirley Temple girl with her Scottie dog. Baby Boomer Die-Cut Valentines - Especially love the "hoppy" frog card. Photos of vintage Valentines - Be sure to see the mechanical tango dancers, and the unique older handmade card. More 1940's Valentines - The soda fountain is just too cute! 1920's to 1930's vintage Valentines - The Red Riding Hood card is so charming! 1950's to 1960's Die-Cut Valentines - They are all cute, but I think I like the bowling Terrier dog most of all. Baby Boomer Valentines - The top card pictured, of the little girl painting with her dog, is especially cute. Whitney Made Valentines - These cards from the 1920's to 1930's are among the most beautiful, with detailed illustrations. The last card pictured, of a little boy and girl under an umbrella, is so sweet. 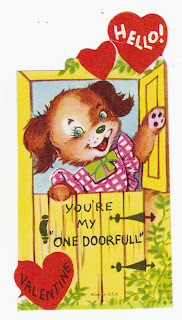 More Baby Boomer Vintage Valentines - The first card features a little girl and her Dachshund. I collect vintage Dachshund cards and have one of these in my collection. Sweet 1950's Valentines - The little girl painting is an especially sweet illustration. Vintage Valentines for Children - The first and last cards pictured are mechanical cards featuring children and dogs, with Charles Twelvetrees illustrations. Elephant Bride Valentine - This card sold long ago, but I'm glad the photo is still here at the blog. I believe this is a Jason Freixas illustration. It was a spectacular card! Anthropomorphic Train Valentine - The anthropomorphic cards are fun! Carousel Valentine - I love vintage carnival and fair items, so find this especially appealing. Mechanical Valentine of a Little Girl and Her Dog - A little girl plays the piano while her dog helps by "singing." And, of course, if you want to see more Valentines, you'll find hundreds at Birdhouse Books.